WGT and Golf Channel are excited to announce the 2014 WGT Virtual Tour, the largest online golf season in history. The WGT Virtual Tour is a free year-long competition, featuring monthly online tournaments where WGT players accumulate WGT Credits by competing against other players in their same WGT tier. Top finishers in the monthly tournaments AND the season-long point standings will qualify for the virtual championship AND the first-ever live WGT event, both held in December 2014. Adding to the excitement, Golf Channel will be covering the WGT Virtual Tour, including online scores, virtual leaderboards, updates and even player interviews on TV, just like the professional Tours! 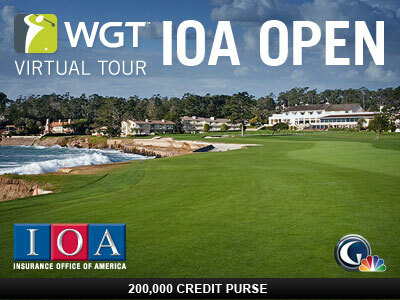 The 2014 WGT Virtual Tour kicks off this month with the IOA Open, sponsored by the Insurance Offices of America, held on Pebble Beach with a record purse of 200,000 WGT Credits. Be sure to post your first round by 1/24 in order to compete in the second round by 1/31 for the best combined score. The Virtual Tour is open to WGT players in all countries, and on both the Web and Mobile versions of WGT. Read more about the Virtual Tour on Golf Channel.